Growing hair begins with a healthy scalp and strong hair follicles. NJoy Essentials Long & Healthy Hair Growth Oil has been specially formulated to nourish and restore the scalp to optimal health with "scalp-friendly" natural oils that are proven to heal and promote a healthier scalp, strengthen active follicles, reinvigorate dormant follicles and stimulate hair growth. Our pomade uses the same active ingredients in a cream base that is completely absorbed into the scalp. Perfect for use with straight styles. Say goodbye to slow hair growth rates. Studies show that human hair grows naturally at the average rate of .25 - .5 inches per month and varies by race. NJoy’s Long & Healthy Hair Growth Oil and Pomade have been shown to increase natural hair growth rates by as much as 400% by stimulating growth within the follicles. Most enjoy double or triple natural growth rates with consistent and proper use. Don’t allow conditions such as bald spots, a receding hairline or broken-off edges to rob you of full, healthy and beautiful hair. 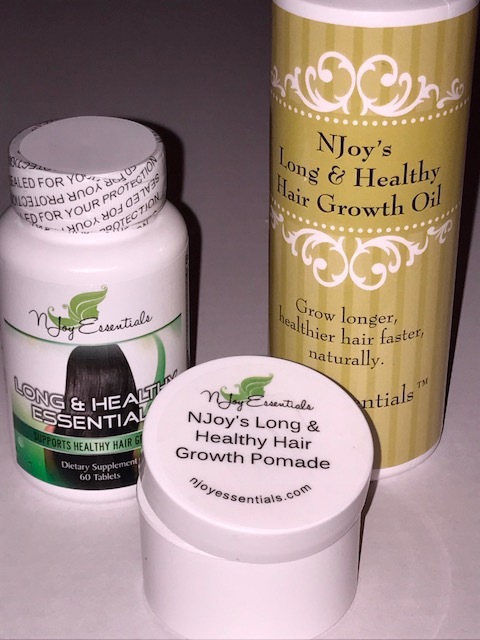 Njoy Essentials’ Long & Healthy Hair Growth products consists of all-natural blends of powerful ingredients that can reverse the effects of balding and increase the growth of new stronger, healthier hair. Ingredients such as Bhringaraj, sulfur and tea tree oil work to heal existing scalp ailments and rehabilitate weak follicles. Our formulas resists build up that can clog pores and retard growth while blocking DHT production to prevent and reverse the effects of hair loss, including male and female pattern baldness. Together, the powerful natural ingredients in our formula work FAST to promote a healthier scalp, stimulate increased blood flow to provide nourishment for stronger, more productive follicles, reinvigorates dormant follicles and produces THICKER and HEALTHIER hair and STRONGER new growth. Our powerful supplement was formulated to give you the RIGHT blend of essential vitamins, minerals, amino acids and herbs to give you longer lasting hair growth that you can trust and rely on without the acne breakouts of other hair growth vitamin brands. Long & Healthy Essentials Super Hair Growth Vitamin isn't your average hair vitamin and sells out fast. Our customers trust the benefits of adding the effectiveness our Long & Healthy Essentials nutrients to their growth regimen and reaping RESULTS! By combining this internal and external combination approach to your daily regimen, you will see an immediate improvement to the condition of your hair and astonishing growth results within weeks. And, of course, we’re here to help you every step of the way with our award-winning customer support. For a limited time, grab all three of these powerful Top Sellers at a special price for this special combo pack. and, a 1 oz jar of our creamy Long & Healthy Hair Growth POMADE. Purchase now for only $49. My daughter got her hair braided on March 7. Later, I took her to get her “halo” redone (March 27) because of her new growth. I cannot lie and say that I was not skeptical about how fast her hair appeared to have grown-because I was! The stylist confirmed for me that it was new growth and not “slippage”! She was correct! My daughter’s new growth was a completely different texture than the rest of her hair! GO NJOY!!!! !